is perfect for placing in your refrigerator without taking up much room. I am not sure how it is in your home, but with 8 people in the family, we are constantly moving, storing, and rearranging things in our refrigerator. Because of this, some foods get left in longer than they should be and cause interesting odors! Then of course there are the spicy things my family loves. Everyone eats Mexican, so they are always salsas, dips and such. Mix that with the onion that I use in just about everything from salads, to tuna, to just about any meat I cook. And then my daughter uses garlic as often as possible. Not to mention just normal refrigerator odors. So, the Oransi Fridge Air Purifier helps with this. It really removes odors, which I really appreciate! Featuring patented Piezo-electric technology your refrigerator is cleaned silently without the harmful side effects of ozone that is found in standard ionizers. Also be sure to "Like" Oransi on Facebook and the follow them on Twitter! Now, this giveaway is going to be run just a little bit different than the others. This time you must Pin It, to Win It. All you need to do for the main entry is pin the above photo on your Pinterest Page. 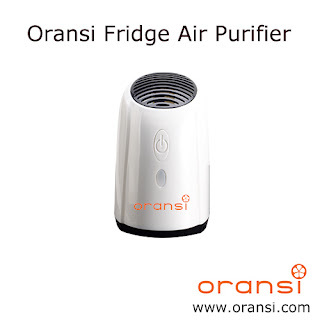 One neighbor will receive an Oransi Ionic Fridge Air Purifier. Disclosure:I received no monetary compensation for this post. I did receive a Fridge Air Purifier for review purposes. Any quotes in red are taken from the Oransi website. All thoughts and opinions are my own. this is a neat product!